HTC's Windows Phone push should start Wed.
HTC says it'll be going all-in on Windows Phone 8 and the first of potentially three devices, expected to be announced Wednesday, has reportedly appeared online. A snap of the long-rumoured device, alternately called the HTC Accord and HTC 8X, was acquired by PhoneArena, showcasing a handset boasting the logo of U.S. carrier Verizon Wireless. 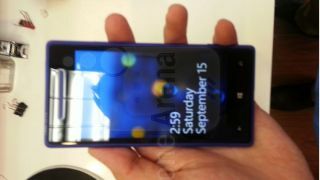 The navy-blue styled handset looks a lot like the recently announced Nokia Lumia 920, which also features a square-edged candy bar form-factor. HTC's first venture into the new version of Microsoft's smartphone operating system is widely expected to include an 8-megapixel camera and a 1.2GHz dual-core Qualcomm Snapdragon CPU. According to the report, there's no room for a microSD card for expandable storage, but previous leaks have suggested both 16GB and 32GB models will hit the market. Also rumoured to be laying within the Accord/8X is a 4.3-inch touchscreen, built-in Beats Audio technology, NFC connectivity, 1080p HD video recording, and 1GB of RAM. HTC is holding a media event in New York Wednesday, which kicks off at 4pm UK time (11am EDT), where it is expected to unleash a trio of Windows Phone 8 devices. Keep it locked to TechRadar for full coverage of the launch, which HTC hopes will reinvigorate its smartphone challenge following an underwhelming couple of years. HTC is likely be going head-to-head with Nokia - Microsoft's preferred partner - as both companies look to put a dent in the gargantuan lead held by iOS and Android. Samsung also has a fleet of WP8 devices on the way, while LG says it is starting to look at developing for the platform once again, after swearing off the OS earlier this year.